If you are looking for an opportunity to serve alongside the international church, then consider being a part of this short term mission trip to the heart of Mexico. During our time there we will participate in ministry projects associated with United Brethren churches in and around the city of Queretaro, Mexico, including children’s ministry programs. Come explore the possibility of developing your own ministry partnership between your home church and a United Brethren church in Mexico. Team size: Limited to 20 people. Application Due Date: February 15, 2017. Available to people from all United Brethren churches in the United States. Must be 16 years old or older to participate. Pre- and post-trip meetings will be held online and in person. Speaking Spanish is helpful but is NOT a requirement. For more information, call Bobby Culler at (717) 264-8414 ext. 204 or email at: bobbyc@mtp-church.org. Visit the Global Ministries website. Materials at the FAME warehouse. 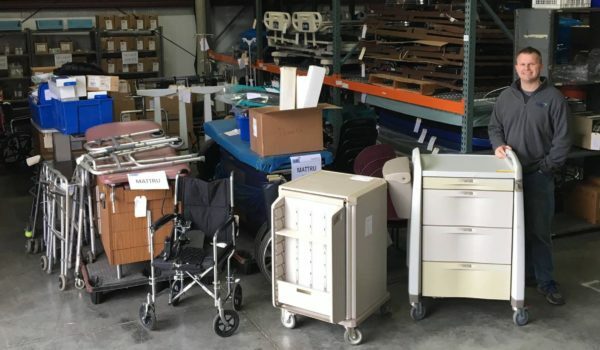 On January 26, Global Ministries staffers went to Indianapolis to pick up over $18,000 worth of medical equipment and supplies for Mattru Hospital. It all came from FAME (Fellowship of Associates in Medical Evangelism), an organization that receives medical, dental, and other healthcare supplies from generous donors and channels everything to mission hospitals and medical missionaries. The same day, Global Ministries received $5000 in medical supplies from DeKalb Memorial Hospital of Auburn, Ind. Dr. Richard Toupin, a former UB doctor at Mattru, works at that hospital. He and his wife, Cathy, will lead a medical team to Mattru in February. Global Ministries did an inventory and created a shipping list of all items, and then delivered everything to West African Education and Medical Mission for shipment to Sierra Leone. Directors Drs. Karen and Tom Asher generously offered us 20 feet of space in a 40-foot shipping container they are sending to Sierra Leone this month. 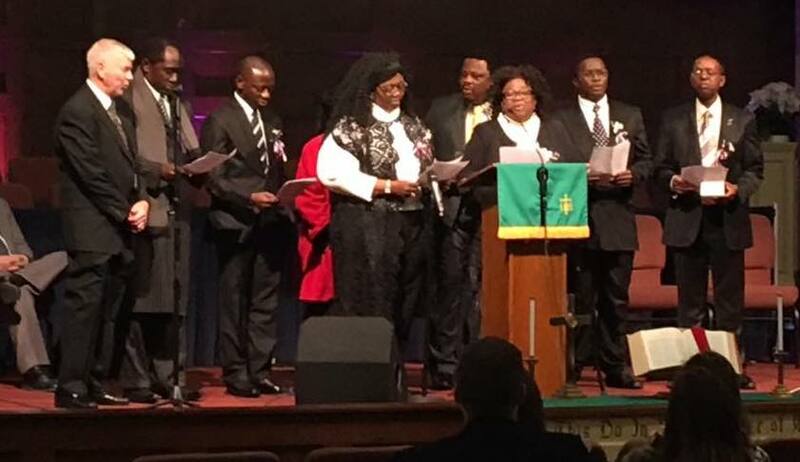 The funeral for Evelyn Baker–former UB missionary in Sierra Leone and First Lady of Huntington University–was held Saturday, January 28. (Full obituary.) The funeral was held at College Park UB church in Huntington, Ind. While serving as missionaries in Sierra Leone during the 1950s, DeWitt and Evelyn started Centennial Secondary School in Mattru, the country’s first United Brethren high school (read more about Centennial’s beginning). At the funeral, a delegation of alumni from Centennial, who now live in the States, traveled through the night from the east coast. They blessed the funeral service with two songs. The first was sung in the Mende tribal language spoken in that part of the country. For that song, they invited DeWitt and Evelyn’s son Ron, who is fluent in Mende, to sing with them. 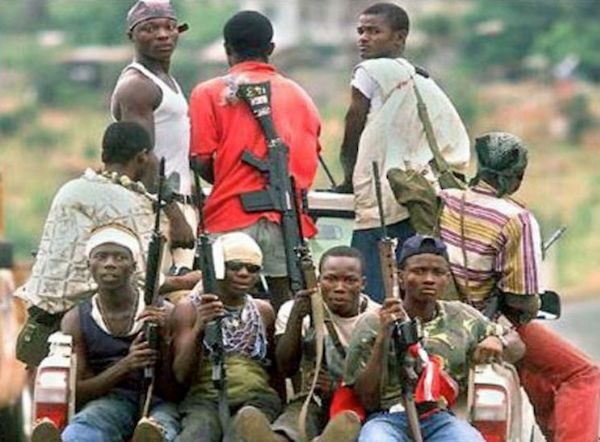 On January 30, 1995, rebels captured the town of Mattru Jong in Sierra Leone. Everyone saw it coming. Rebels had taken Bumpe, then the nearby Sierra Rutile mining camp. It was only a matter of time before they came to Mattru. In mid-January, Mattru Hospital essentially closed down. Nadine Hoekman, a UB nurse, paid all the workers and locked things up. 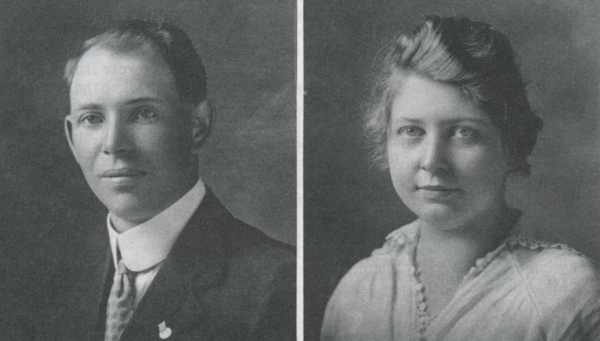 Then she and the only other remaining missionaries, Joe and Rachel Beah, headed to Freetown. Two staffers stayed to give daily medication to tuberculosis patients. Rebels ransacked Mattru Hospital, taking everything of value. They even dismantled the X-ray machine. They loaded it onto a boat and headed toward Guinea to sell it, but the launch sank in the Atlantic Ocean. Mattru, like many towns throughout the country, was deserted as residents fled into the bush. Many United Brethren people were among them. Two UB ministers were taken prisoner. The RUF settled in for eight months, establishing its own government and turning Mattru Hospital into a training base. 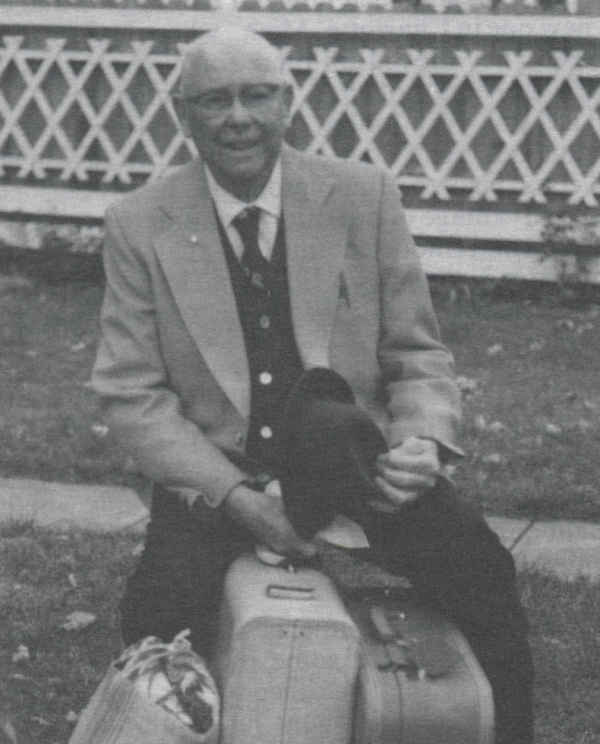 On January 29, 1989, Dennis Miller preached his first message as pastor of Emmanuel Community Church in Fort Wayne, Ind. It was a congregation of about 100 people primed for growth–good leadership, nice facility, great location in a growing area. Miller was exactly the right person to help Emmanuel fulfill its potential. 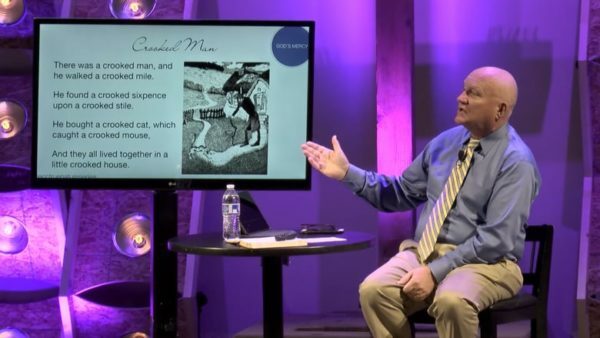 He brought leadership, vision, a strong pulpit teaching ministry, and a focus on discipleship. Within seven years, Emmanuel had grown to 600 people and completed two major building campaigns, including a 700-seat sanctuary. And in 2009, 20 years after that first sermon, Emmanuel became the UB church with the highest average attendance, shooting past the 1400 mark (King Street church in Chambersburg, Pa., had been the largest church for many decades). In 2011, attendance went past 1800, with 71 conversions and 93 baptisms for the year. Soon after he came to Emmanuel, Miller developed the church motto “His Word, Our Walk.” Nowhere was that theme more clear than in the many weekly GROW discipleship groups which systematically led people through the whole Bible and helped them grow deep in their Christian walk. It accounted for the ever-broadening leadership base, which in turn fueled the church’s growth. On January 28, 1952, Bumpe Bible Institute opened as the place to train United Brethren ministers in Sierra Leone. The initial class had 12 students. Two months before, Rev. M.E. and Francis Burkett arrived on the field with sons David and Stephen. At that point, land had been cleared and construction begun on a two-room school. The Burketts took up residence in a thatch-roof house in Bumpe. Rev. Burkett served as principal of the school, and taught alongside two Sierra Leonean ministers. The next year, they were joined by Bernadine Hoffman, who had previously served two terms in Sierra Leone. During the second and third years, dormitories and dining rooms were added to the campus. Bumpe Bible Institute was short-lived. In 1964, we joined with three other denominations–Missionary Church, Wesleyan Church, and Wesleyan Methodist–to start Sierra Leone Bible College (now Evangelical College of Theology). On the vacated land of Bumpe Bible Institute, we built the current Bumpe High School. Wesley Skiles (right) has been appointed senior pastor of Olive Branch UB church (Lakeville, Ind.) effective January 15, 2017. He holds a provisional ministerial license. Skiles graduated from Asbury College in 2001, and is currently pursuing a masters degree at Huntington University. He has served in ministry since 2001, including 2011-2014 as associate pastor of youth at Heart O the Lakes UB church (Brooklyn, Mich.). He and his wife, Tracey, have three children. Rev. Gonzalo Alas (right) is the new superintendent of Honduras Conference. 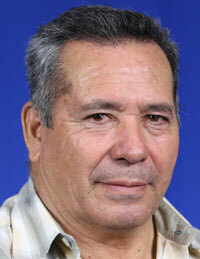 He was elected on January 21 during the conference’s annual meeting. We now have over 115 United Brethren churches in Honduras, mostly in the northern part of the country around San Pedro Sula and La Ceiba (the nation’s second, and third-largest cities). La Ceiba has been the conference headquarters throughout its history. In 2007, Honduras sent Rev. Alas to start a church planting movement in El Salvador. He had previously started churches in the Copán region of Honduras, where previously there were no UB churches. When he left El Copán to go to El Salvador, 13 established churches and five church plants were functioning. He takes the place of Juanita Chavez (right), who had served two terms as superintendent, beginning in 2009. Under her leadership, Honduras Conference was instrumental in establishing a church-based leadership training program called ETBIL (Educación Teológica Basada en la Iglesia Local). It has become a model for all of our Central American churches. The conference also approved Milton and Erika Pacheco as their missionaries to Thailand. Rev. Alas, his wife, Gladys, and family as they transition back to Honduras. The five church plants and their leaders in El Salvador, whom Rev. Alas faithfully mentored and trained. Rev. Juanita Chavez and her husband, Carlos, who have been faithful and committed servants of the Lord over the past eight years. 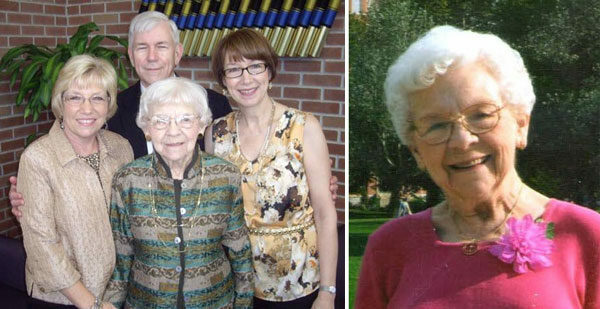 Left: Evelyn Baker with her children (l-r) Joyce, Ron, and Annette. Ruth Evelyn Baker passed away on Friday, January 20, 2017, in Huntington, Ind. She was 98 years old. Evelyn and her husband of 57 years, DeWitt, served 26 years as missionaries in Sierra Leone, 1949-1965. Evelyn then became the First Lady of Huntington College, while DeWitt served as president 1965-1981. Visitation: 6-8 pm Friday, January 27, 2017. Visitation location: Deal-Rice Funeral Home–Huntington Chapel, 338 E. Washington St., Huntington, IN 46750. Funeral: 10:30 am Saturday, January 28, 2017. Visitation one hour preceding. Funeral location: College Park UB church, Huntington, Ind. Evelyn graduated from Huntington College with an elementary education teaching certificate, and then taught first grade in Wren, Ohio. She and DeWitt were married August 16, 1942, while he was serving as a Navy pilot during World War 2. They moved to Sierra Leone in 1949 with sons Ron and Norman. They were first stationed at Bonthe, where Evelyn was the head matron at Minnie Mull Girls’ School. They were later stationed in Gbangbaia, then Mattru, and later Bumpe. While in Mattru, eight-year-old Norman was killed in a boat accident during a school excursion. Daughters Joyce and Annette were born during their years in Africa. DeWitt was elected president of Huntington College in 1965, and they both spent the rest of their years in Huntington. DeWitt passed away in 2000. Evelyn was a member of College Park UB church. She played the piano for Rotary Club and at local nursing homes, was an avid bird watcher, and loyally supported Huntington University basketball. Evelyn is survived by son Ron (Berrien Springs, Mich.), daughter Joyce Hewitt (Brazil, Ind. ), and daughter Annette Shepherdson (Longwood, Fla.). There are ten grandchildren and 23 great-grandchildren. Preferred memorials are to Huntington University or United Brethren in Christ Global Missions, designated to Mattru Hospital. Contributions can be sent c/o Deal-Rice Funeral Home, 338 E. Washington St., Huntington, IN 46750. George Daniel Fleming was born January 21, 1890, in Ionia County, Mich. He was one of the United Brethren giants of the 1900s–missionary, pastor, missions director, author, mentor, and prayer warrior. Many knew him as “Mr. Missions,” a fitting title for the man who headed our mission work for 25 years. Fleming became a Christian at age 13 under the ministry of his father, a UB pastor. In 1911, at age 22, he and his wife of 11 months, Daisy, sailed for Sierra Leone, where he became principal of the 120-student school at Danville. After 13 months, they were sent to Bonthe to begin a girls’ boarding school. Altogether, the Flemings spent 20 years–five terms–as missionaries, returning to the States in 1932. After a few years pastoring a church, Fleming was elected as the denomination’s General Secretary of Missions (what we now call Director of Global Ministries). During his tenure, we opened mission fields in Honduras, Jamaica, and Hong Kong. He continued in that office until retiring in 1961. He then wrote two books about the history of the Sierra Leone mission. Those who knew George Fleming recognized him as a man who lived his life as though in the presence of God.